Rochester Hills, MI- If you have ever wondered what it would be like to step back in time and live in a castle from days of old, you do not have to travel far from home to have that experience. 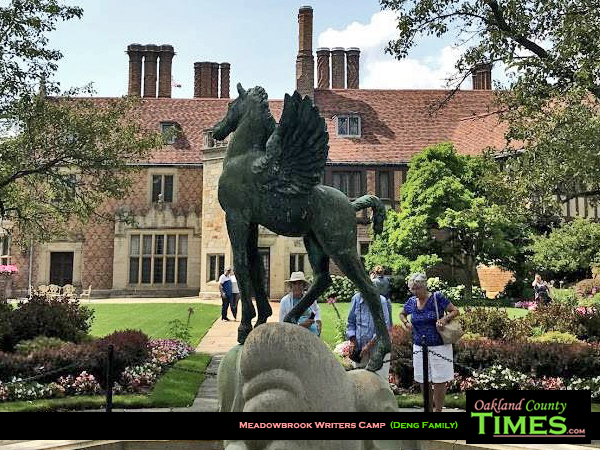 Meadow Brook Hall, the grand 110-room mansion on the campus of Oakland University, with its manicured grounds and charming gardens, is an historic place to explore and create. 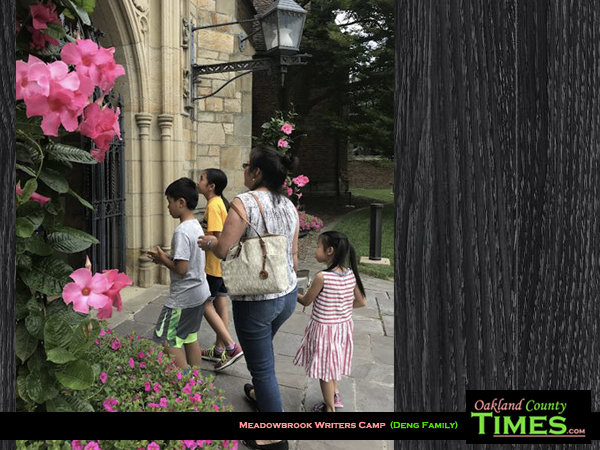 Every summer, students from grades K-12 have the opportunity to practice their writing skills in “America’s Castle” at the Meadow Brook Youth Writing Camp. In addition to exploring new ways to inspire and create pieces of writing along with fellow students and teachers, students are given tours of the interior and exterior of the vast mansion. Additionally, it is a chance to learn some local history. Each week-long camp runs from Monday through Friday throughout the summer. You may choose to attend the half day camp or the full day camp for that week. This is a little history on Meadow Brook Hall for you: The mansion was built by Matilda Dodge Wilson, the widow of John Dodge. She later married Alfred Wilson, and they built Meadow Brook Hall together between 1926 and 1929. The total cost was about $4 million – that would be almost $60 million in today’s dollars. The home belonged to Mr. and Mrs. Wilson along with their children, Frances and Daniel (from Matilda’s previous marriage,) and their adopted children Richard and Barbara. The week of camp started off with an interview with a fellow student. The purpose of this was to get to know each other, and to tap into each other’s imagination. It was a writing camp after all, so this exercise would inspire ideas for stories and poems. After the first activity, teachers proceeded to inform students of the different ways to create their very own pieces of writing. Students used various activities to create their stories and poems. In one activity, students wrote a “Where I am From” poem. They began by listing things in different categories. The categories were family/traditions, sights, sounds, tastes/smells, touch, and feelings. Students wrote things from their own experiences that applied to each category. For instance, a student could fill in the feelings category with how ecstatic they had felt when they won an award. After filling up all the categories with personal experiences, each category was a stanza in the poem, and each line was an experience in that student’s life. This activity encouraged using senses to connect with the reader. Students also wrote an autobiographical poem. In this poem, students used adjectives to describe themselves. This was a simple way to create a poem, yet a very effective way. Another activity that teachers presented to the students to forge a poem was passing around different words that were to be included in a poem. Teachers gave a handful of miscellaneous words to every student, and each student was to construct their poem out of these words. Students also exercised their story writing skills with activities as well. One of those activities was to use abstract words as characters in a story. The character is to portray an abstract word, meaning that if you desired your character to portray happiness, the character would act and talk, as the epitome of happiness. Students shared their works with others in a digital format. Students in third grade or higher had the opportunity to turn one of their pieces of writing into a digital story. Students headed to the Kresge Library and used Animoto, an easy-to-use tool for video creation. The final products were uploaded to YouTube to share with family and friends. After a day of hard work, it was off to splash around in the fountains in front of the Elliot Clock Tower! 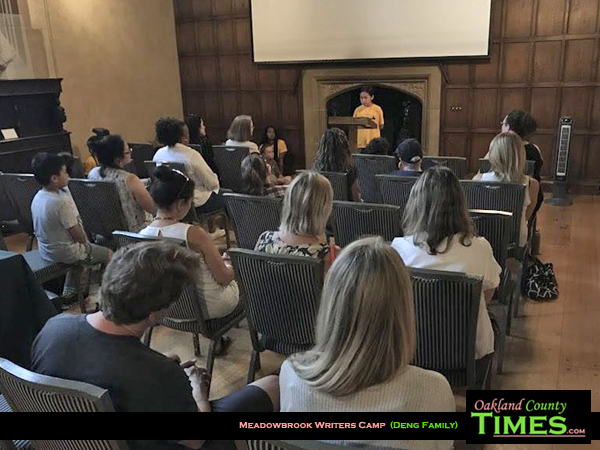 Besides exploring the enchanting realms of story writing and poetry, students learned about the mansion’s history and toured the mansion. The biggest room in the mansion was the living room, which features the famous painting “Strawberry Girl,” whose eyes follow your every move! 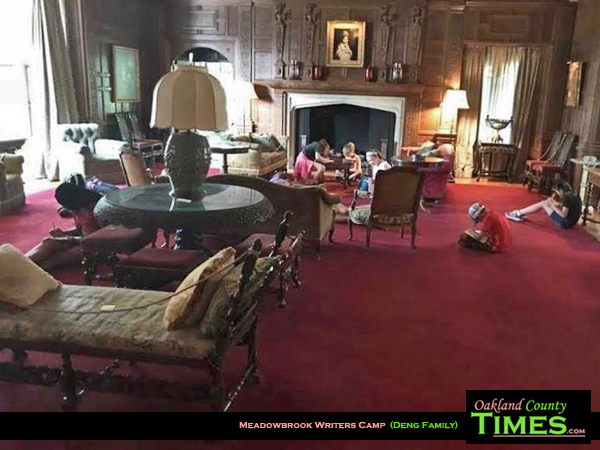 Students were also treated to some “behind the scenes” secrets of Meadow Brook Hall. These included the secret staircases. One of them is in Mr. Wilson’s study, and leads to the downstairs game room, or upstairs to his personal barber shop. The Dodge children also had play rooms above their bedrooms that were their own private spaces. 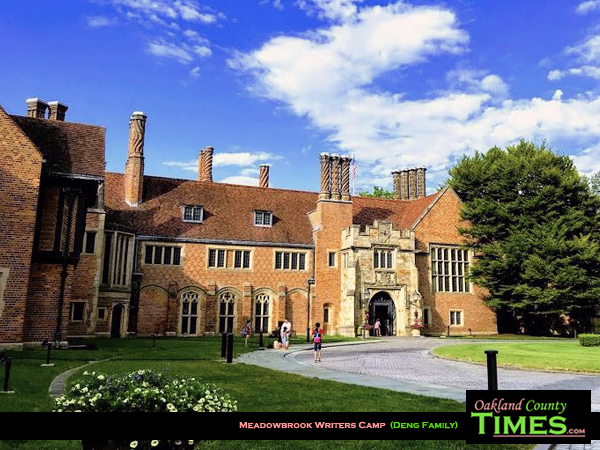 The Meadow Brook Youth Writing Camp is a perfect opportunity to take a trip back in time, exercise your imagination over summer vacation, and have some fun, too. The camps run every summer, so think about taking your own adventure next year. My student Isabelle Deng is a 7th grader at Grissom Middle School in Sterling Heights who also studies at Private Literacy Tutoring of Troy. Check out more of her work HERE.